A much weaker than expected home sales figure sparked a QE rally that impacted the financial markets, as well as the commodity markets. As we've come to learn, "bad numbers are good" when it comes to asset prices simply because weak economic data encourages the Fed to keep fueling the stimulus fire. Today was no exception. New home sales were reported to be 394,000 in the month of July. This is down from 455,000 in June, and well below expectations of 485,000. It is clear that the recent run in interest rates has had a toll on home sales, but we doubt weak home sales will be a new trend. As the resident of one of the biggest boom and bust cities in the country, Las Vegas, I get the pleasure of seeing economic trends in a magnified state. Home buyers are scrambling into purchases out of fear that the current relatively high rates, will be even higher in the future. Similarly, those that foreclosed or sold their homes short at what turned out to be the lows in the real estate market, are trying to get their foot back in the door. It is a full-on real estate short squeeze! If Treasuries find an intermediate low (as we believe they will) and interest rates peak out, home buyers could easily flush the markets. Of course, this could take a few months to play out. 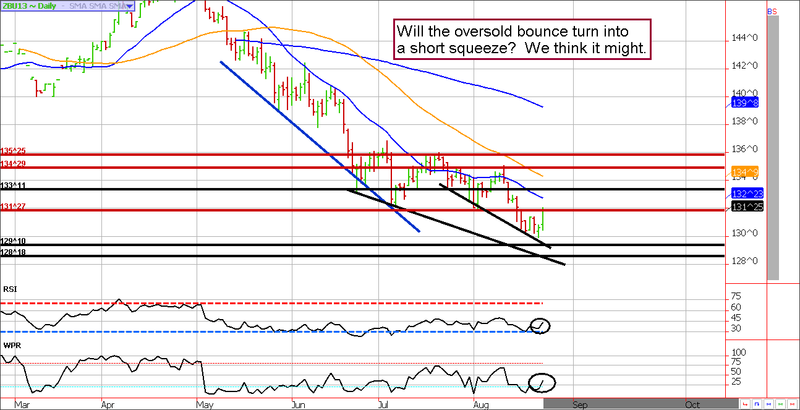 Bottoming or just a bounce? We'll know by the middle of next week whether Friday's action was a legitimate low, or if it was another head fake in a treacherous bear market. For what it is worth, we've noticed that major bear market moves in the 30-year bond futures have had a tendency to run their course after a 20 handle decline. In this scenario, we've seen the long bond fall from about 150ish to 130ish. You probably don't need a calculator to conclude the spread from peak to valley is at the magic 20 handle mark. Obviously this is an overly simple view, there are an unlimited number of factors in play. Nonetheless, markets like patterns and this is one we've noticed. If we are dead wrong, and the market isn't finding an intermediate low near the 130 level the slide could see prices as low as 126. Nonetheless, yields are higher than they've been in years; we believe at some point soon investors will opt for safety and a guaranteed coupon. **Consensus:** The relief rally is finally here. We are looking for follow through buying next week. We'll need a break and hold above 133 to give the bulls an edge. August 15 - Sell October 30-year bond 126 puts near 29/30 ticks, or $468. August 22 - Buy November 10-year note 127 calls for about 13 ticks. These are limited risk "lottery tickets" or "flyers" just in case the rally gets hot! There has been a lot of talk about the massive re-balancing of portfolios in which investors move into stocks and out of bonds. Many have spent the last several months clamoring to buy stocks and sell bonds with seemingly little preference in regard to price. Most TV pundits seem to believe this will continue, but we have our doubts. Stock yields are no longer paying more than Treasuries and investors perception of risk seems to be distorted. In other words, the market is scared of bonds and too comfortable with stocks (which is the opposite of historical norms). We remain overall bearish the equity market in the near-term, but the bounces will be big on the way down (assuming that is where we are going). This bounce was needed for the market to digest the sell-off from the 1700 level (which involved little back and filling trade). We were looking for the mid 1660s, today's high near 1663 was pretty close but it might not have been was quite enough to satisfy the market's "needs". If the mid 1660s don't hold, it is possible we see 1673 through 1676 but we have to think the upside is limited to these technical levels. **Consensus:** We think this is the beginning of a bear, the bounce might be short-lived. 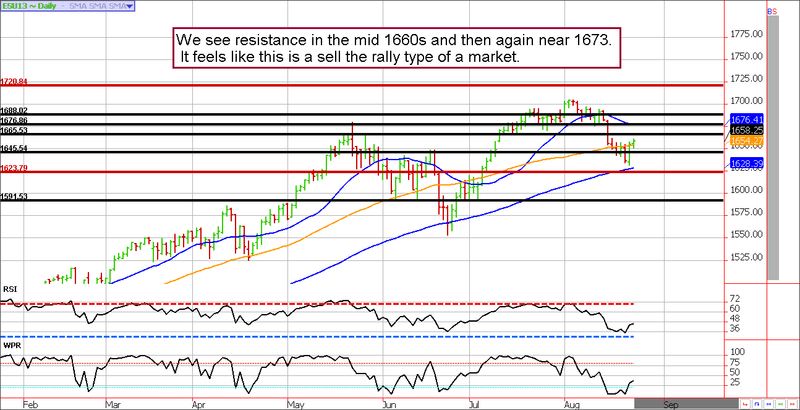 Look for resistance near 1665 and then again from 1673 to 1676. August 13 - Buy back October crude 94 puts near 20 cents to lock in a profit of 50 cents or $500 per contract before commissions and fees. We'll hold the short calls for now. August 20 - Sell the October 98 put for about 48 cents ($480). This brings the position back to a neutral strangle).